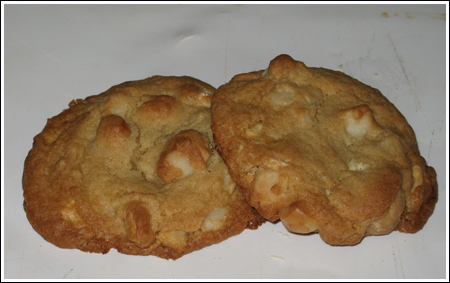 These cookies are so gorgeous I’ve named them Masterpiece White Chocolate Macadamia. They’re all butter, but they have the great texture you often get from shortening based cookies. One note about the picture. The cookies here were made from dough that had not been chilled. Your cookies might be a little thicker if you chill the dough. In a mixing bowl, cream butter and both sugars. Beat in eggs, vanilla and Baileys (or creamer). Stir together cake flour, baking soda and salt. Stir in nuts and white chocolate. Drop dough by rounded tablespoons onto a parchment or nonstick foil lined baking sheet. Bake for 11-13 minutes. For every 2 cups of cake flour, use 1 3/4 cups all-purpose and 1/4 cup cornstarch. In this case, that would be 2 2/3 cup all-purpose plus 6 tablespoons of cornstarch. Okay, I’m glad that it wasn’t just me! I still have half a bag of macadamia nuts, so unless some other recipe catches my eye, I think I’ll make these again and add either less heavy cream or more flour, because I did think they had a really good flavor. I just made a batch of these and mine came out flat too! I didn’t have any Bailey’s either, so I used 5 teaspoons cream and 1 teaspoon Kahlua. For the flour, I used the cake flour sub formula. I can’t believe they came out flat because the haven’t in the past, but now I’m wondering if it had something to do with the heavy cream/booze sub. Maybe we should stick with Bailey’s! I’m going to check with Sue and see if she’s ever used a substitute. A flour chart is not dorky at all! That’s smart. I always use 114 grams for 1 cup of cake flour which would mean a total of 342 grams, so volume-wise, your full batch would have been about 2 tablespoons less than mine if you used 330 grams. I’m not sure that little bit of cake flour would have caused the thinness, though. I’m going to re-test this with weights. When I first made these, I didn’t use gram measurements so who knows how much cake flour I really scooped? Also, I know I’ve made these with the cake flour sub (all purpose plus cornstarch) many times as well. I will do some re-testing. I made these last night and I used 5 tsp of heavy cream and 1 tsp of brandy for the Baily’s and it worked well. They tasted great, but came out pretty thin. The dough did seem soft so I put it in the fridge for an hour to chill. I’m wondering if my flour measurement was off? I used cake flour and weighed it in grams, figuring 110 grams per cup (330 total for this recipe). Do you use a different weight for cake flour? (I looked up a bunch of weights, made a chart and laminated it to put on my fridge, super dorky, but convenient!). Oh, yes, I meant the Baily’s! I really wasn’t already imbibing when I wrote that comment! 1/2 and 1/2 or cream would be excellent, as I have both in the fridge right now. I think you mean the Baily’s, and yes! You can use half & half or cream. Hi, is there anything that I could sub in for the Kahlua? It sounds good, I just don’t have any around the house. (I have some rum and some brandy, but that’s about all for liquor.. oh, and beer, but I can’t image that that would be good!). I have the white chocolate chips and the macadamia nuts, and these sound so good! I wasn’t able to post your comment, but to answer your question, 2 sticks of butter = 8 oz of butter or 16 tablespoons. these cookies look great. However, I’m a little confused with one of the ingredient. What measurement do you mean by a ‘2 sticks’ of butter? I have made these several times, a couple of batches WITH the Bailys and a couple of batches with just milk. I can tell the difference with the Bailys and I would recommend using the Bailys. They are delicious either way but with the Bailys, they are more decadent! Amazing what 2 Tbsp can do! Val, the Top 10 list is a work in progress. It’s going to be tough choosing only 10 and I’ve been hesitant on doing a top 10 — especially since I change my mind so often. I liked these because of the crunchy edges and overall texture. They could use a bit more vanilla, though. These days I’d take them over the other ones (link below) mainly because they are all butter and don’t have any shortening. Also, I made another version yesterday and will post it today. I was surprised to see this made your top 10 and your giant white chocolate macadamia cookies aren’t there. could these possibly be better than your recipe?? I love your recipe and can’t imagine a better one! what makes these different and/or better? also, can you tell me about the texture? I am curious what the cake flour’s effect is. Thanks for pointing that out to me Anna. I have tried the Triple Play Cookies and the Pecan Pie Cookies from that list. Both are fabulous. What to try next??? If you look to the left and kind of scroll down, there’s a category that says “Top Ten”. It’s hard to pick just 10, but those cookie recipes are ones I count among my most reliable and best. Thanks for trying them, T.
I sent these to work with Todd and he said everyone really, really loved them. I’m going to try making them again with milk instead of Bailey’s, a bit more vanilla extract and chocolate chips. I made these cookies and they were fab!! This was the first time using cake flour in place of flour for cookies. The dough was softer and I did put it in the fridge. They looked the same as yours!! YUM! p.s. Have you tried the mint flavored Bailey’s??? Oh boy mamma’s got a new fav! Tori, I hope that tooth comes out soon. Fuzz has another loose one. Longhorn Kristin, Pop & Fresh loves champagne at Christmas. He prefers dry over Brut. Drew, cake flour should be pretty easy to find. There’s really only one brand and it is called “Swan’s Down”. It comes in a red box. Those cookies look amazing! I can’t wait to try them! My daughter had a really loose tooth and we were joking about the tooth fairy and santa having coffee together if the tooth fell out. It is still hanging in there though. Therese, I had a feeling you would know what “The American Club” was ;).